The eyes can portray so much, from your current emotion to your level of energy. Unfortunately, the eyes are often one of the first features to show age. Wrinkles around the eyes, sagging eyelids, drooping brows and puffiness underneath the eyes can cause one to look tired, sad or even angry. If you want to restore vigor and youth to your eyes, consider eye and brow lift surgery from a reputable facial plastic surgeon in Houston. Dr. Sanaz Harirchian is a board certified and fellowship trained facial plastic surgeon who brings talented artistry and refined skill to cosmetic surgery for the eyes. She uses minimally invasive techniques to produce natural, long-lasting outcomes for patients who want to turn back the hands of time and regain a more confident version of themselves. Our menu of eye and brow procedures includes options to address a wide variety of cosmetic concerns using both surgical and non-surgical methods. We want our patients to achieve the rejuvenated look they desire using a procedure approach that they feel comfortable with. Dr. Harirchian understands how to correct the delicate skin around eyes in order to create a revitalized and beautiful appearance. When it comes to blepharoplasty, or an eyelid lift, she can effectively address hooding due to sagging upper eyelid skin as well as under eye bags caused by excess fat. By smoothing wrinkles around the eyes and lifting the eyelids, patients can look energetic, more attractive and younger. Patients may also choose a forehead or brow lift to support a fully rejuvenated look around the eyes. 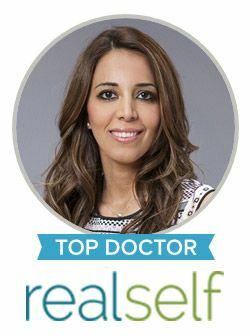 As with any type of cosmetic improvement on the face, Dr. Harirchian offers advanced surgical techniques for more permanent results as well as the most proven non-surgical treatments using fillers and injectables. At our leading Houston practice, we value the importance of a personalized approach in plastic surgery. Each face is unique and each patient brings specific goals and ideals for surgery. Dr. Harirchian takes the time to listen and understand your concerns regarding your aging eyes before developing a customized treatment plan. To schedule your eye and brow lift surgery with Dr. Harirchian in Houston, please contact us today. We welcome the opportunity to help you look and feel your best using the latest technology and technique that modern plastic surgery has to offer.